Showing 1 - 4 of 4 Products for Tailgate Trim. Chrome Trim Tailgate Accents are made of Chrome-plated automotive grade ABS. Installs easily using pre-applied 3M(TM) Tape. Unique design for modern trucks. 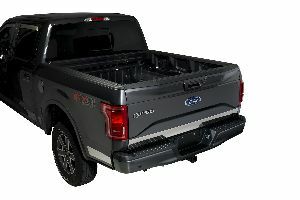 FORD F150-STAINLESS STEEL-UPPER/LOWER TAILGATE ACCENT-3 PCS. Stainless Steel Upper And Lower Tailgate Trim; 3 pcs. FORD F150-STAINLESS STEEL-LOWER TAILGATE ACCENT-1 PC.